Submitted by The Amethyst Dragon on 2018-03-15 18:08. 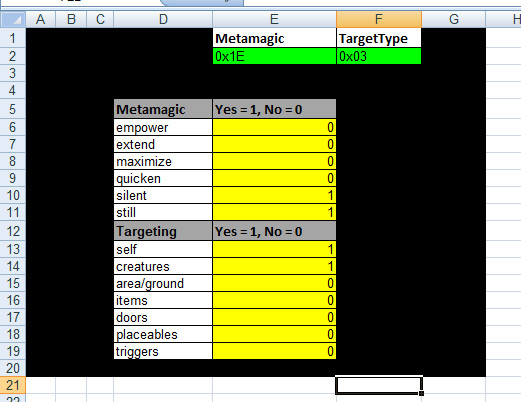 This is a simple Excel worksheet that calculates and generates the hexidecimal values you need when creating or modifying spells via spells.2da (for the Metamagic and TargetType columns). Set a "1" for each option that applies to your new spell. Click on another cell to let it do the calculation. Your end values will be in the green cells. But, quick question, do you have a set that includes the Persist metamagic feat? I am unaware of a persist metamagic. Is that a NWN2 thing? Sorry. I didn't even realize it was for NWN1. I really should read the description better, but I bet NWN1 creators will love this.